Some people dare to claim that here you will experience one of the funniest Comedy-Magic-Acts in existence. For 30-40 minutes "Captain Green's" Green Air offers you a crazy trip without having to pack your bags. Integrating slapstick fun and audience participation, "Captain Green" performs slight-of-hand and conjuring stunts.. For instance money suddenly appears out of the air, a massive cannonball booms unexpectedly down to earth or you enjoy magical rings in perfection. All the stunts are spell-binding and will be the magical highlight of your event. 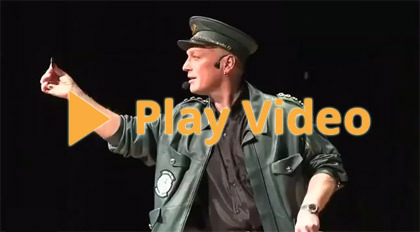 Captain Green says: "Welcome on board Green Air, the first fool-proof magical airline. Please fasten your seat belts and check your oxygen mask, because you will be carried off on a magical trip never seen before… !" The air passengers comment: "Magical flights with the King of Kerosine are fantastic and the VIP's likes it too!"